Vicious Art is quite the appropriate name for this Swedish metal troupe that boasts former members of Dark Funeral and Entombed in its fold, as the punishing 10-track release stomps with the fervor you'd find from Cannibal Corpse and Hypocrisy. Blast beated madness is the most prominent weapon used here, as the mighty double bass pedal is used ad nausea, almost to the point of becoming redundant. The guitars are crisp and fleeting, and the vocals are the perfect union of growl and scream, and when doubled on tracks like "A Whistler and His Gun", sound like Hell has risen to Earth. 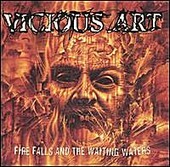 Vicious Art isn't the most unique band on the map, but this quintet packs an undeniable wallop that can floor you.